Incredibly durable and made from the highest quality Fil d'Ecosse, these men's dress socks are hand-finished creating a premium men's sock, available in a range of colours. The Fil d'Ecosse Danvers 5x3 Rib will elevate your formal look. 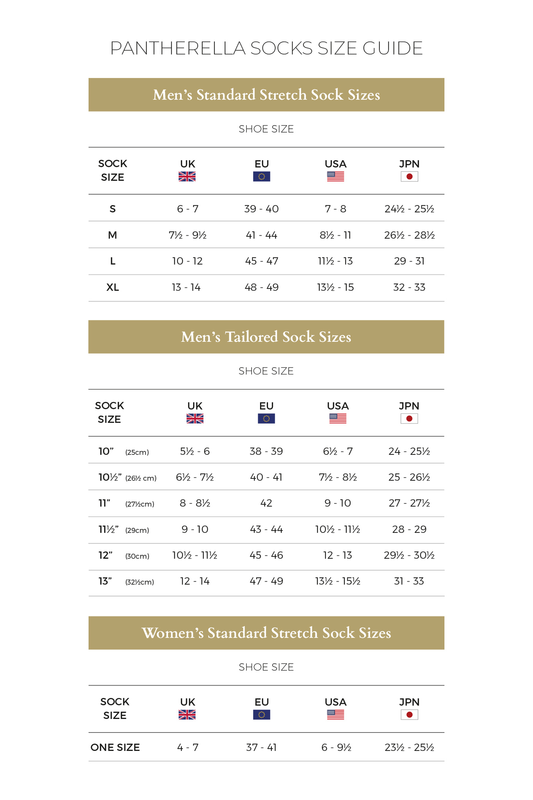 Incredibly durable and made from the most superior Fil d'Ecosse these men's socks are hand-finished creating a premium men's sock, available in a range of colours. Designed with comfort and style in mind, the Danvers 5x3 Rib from Pantherella will become your go-to socks of the season. They complement a crisp pair of denim jeans as much as they do tailored trousers. Danvers Fil d'Ecosse socks are a firm favourite for many discerning gentlemen. The Danvers Fil d'Ecosse socks feature the famous Pantherella 'seamless' toe, as you'd expect with a sock of this quality. Our Egyptian Cotton is grown and processed in the Nile Delta and then spun into the highest quality yarn in Italy. The fibres of this ‘Giza 88’ Egyptian Cotton are very long, which means that they can be spun into a very fine yarn. These long fibres are also resistant to ‘pilling’ and therefore make very durable, hard wearing socks. The Mercerisation process removes all loose fibres from the yarn, meaning that it is completely smooth and fluff free. The result being that our Mercerised Cotton Lisle socks have a very silky and shiny appearance. The Mercerisation process also increases the porosity of the yarn, meaning that it can be dyed to a deep, rich and vibrant colour palette and retain this colour well.. The Egyptian Cotton Pantherella use for Mercerised Cotton Lisle socks has a count of from 2/60NE to 2/100NE – this number translates as the thickness and weight of the yarn (2 ply x 60-100 yards per lb). Pantherella Cotton Lisle Socks are knitted on a 200 needle, fine-gauge machine. The perfect lightweight, formal dress sock. What is Mercerised Cotton Lisle? For our Mercerised Cotton Lisle socks, Pantherella use the finest Italian sourced, extra-long staple Egyptian grown cotton. The extra-long staple determines the highest quality of cotton, as it uses uniform lengths of fibres of over 33 mm. This yarn is composed of two strands that are twisted together with an extra twist per inch than lesser quality cottons, creating one single, strong thread. Once spun, the cotton goes through a process of Mercerisation (devised in 1844 by John Mercer of Great Harwood, Lancashire, England) whereby it is passed through a flame at high speed, to eliminate any stray surface fibres. The result is a shiny, shrink & pill resistant yarn that absorbs dye brilliantly while maintaining its silky lustre.